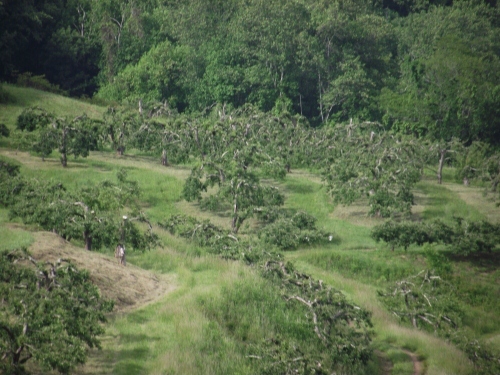 We snapped this shot of the historic Orchard at Altapass while driving the Blue Ridge Parkway. It was the first that I'd heard of the place. It looked intriguing so I decided to find out more about the orchard. This is a pretty intriguing place. 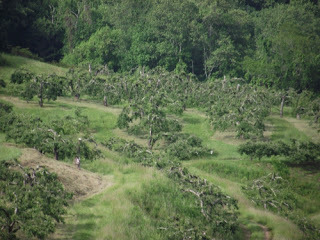 the Orchard at Altapass, NC is over 100 years old. Don't expect to find only apples. It was built in 1908 by the Clinchfield Railroad and now serves as an Appalachian Cultural Center that supports the music, art and life in the Appalachians. 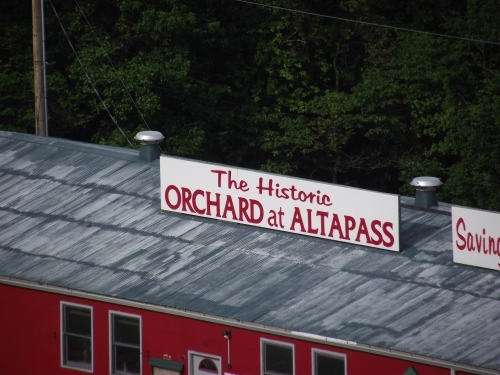 Special events happen frequently at the historic Orchard at Altapss. Music events include bluegrass bands, dulcimer music and hayrides. Those are just the tip of the iceberg. An online calendar has more. I'm not sure what I expected to discover about this spot on the Blue Ridge Parkway. It just looked like an interesting place to photograph. Now, I know that it's all that and more. We're going to have to go back this fall for an up close look at the historic orchard and to learn more about its rich history. Altapass turns out to be a name that was created by the Clinchfield Railroad. The earliest settler in the area was named Charlie McKinney. The name McKinney Pass was already given to the area. The railroad combined the word alta (meaning high) and added it to the word pass to create the name Altapass. What was once a bustling railroad town with hotels and restaurants is now a ghost town. The depot and buildings are gone. All that is left is the historic orchard. VisitNC has an entire page on the historic Orchard at Altapass. You can also find out about it on the Virtual Blue Ridge Parkway guide. Thank you for updating the link.